Dolls always seem to have the strangest features, yes there are still normal dolls out there, but there are just as many oddballs. You can get babies that make noise, that pee their diaper and can even crawl away. The strangest of them all is always the one that can soil a fake diaper. 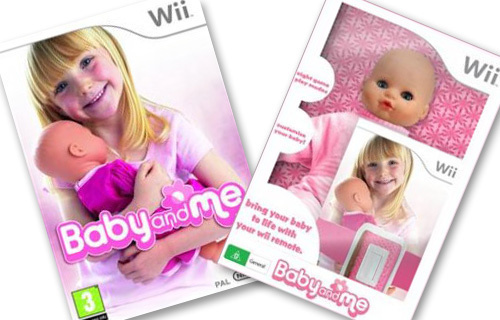 Well now all the little girls of the world can have a doll to go with their Nintendo Wii. The doll has an opening to allow a Wiimote to be jammed into its back. It is created for the game Baby and Me. Within the game it has the girl do the normal things like rock the baby, burp it and even teach the doll to walk. It uses the speaker within the Wiimote to make the baby make the usual noises like crying and laughing. Although the doll looks ridiculous to every rational full grown adult, I’m sure one toy commercial for this would be enough to hook quite a few little girls.